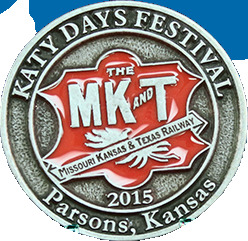 Katy Days is a non-profit organization engaged in celebrating the historic significance the MK&T Railroad had in the lives and on communities surrounding it’s lines. Each coin represents a portion of MK&T history. They are designed to commemorate that history and to insure the continued success of the Katy Days Celebration by providing funding.